Are you aware of Mighty No. 9? That game that blew up (the good way) on Kickstarter and then blew up (the bad way) during its development cycle? The knock-off Mega Man that ended up being so much less than Mega Man? I’m sure you’ve heard of it, but you have probably forgotten about it, like the entire world did shortly after it actually released. Although Beck’s first major outing flopped hard, it’s actually not the only game he’s starred in. Long before the Mighty No. 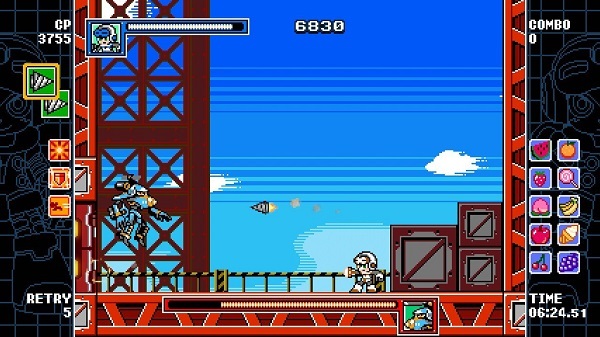 9 debacle, co-developer Inti Creates had made their own little Mega Man-esque title on 3DS called Azure Striker Gunvolt. I haven’t played that game, but it came bundled with a free retraux game that was even more in the vein of classic Mega Man, Mighty Gunvolt. Mighty Gunvolt was a neat little crossover that let you play as either Beck, Gunvolt, or some girl from a game that I still don’t know what it is. It was only five or so stages long, but it was tightly designed, tough as nails, and the three playable characters all had their own style and unique abilities. Needless to say, I liked it a lot. Flash forward several years, all the way to last week. 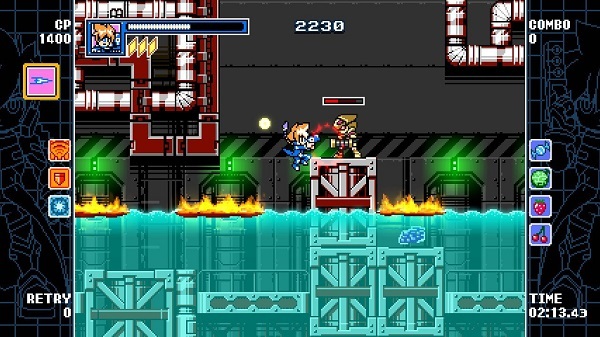 Inti Creates is still hard at work providing Nintendo fans with quality 2D platformers. A week after the system’s launch, the Switch got the excellent Blaster Master Zero, and last week we were given yet another bundle of joy, Mighty Gunvolt Burst. This expanded sequel is a much more robust game, though it does strip out the third playable character in favour of focusing on Beck and Gunvolt. It’s not like I ever even bothered to learn her name, so I’m not too broken up about it. 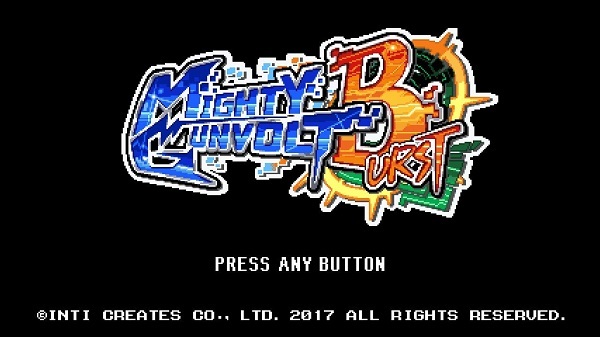 Having been a fan of Mighty Gunvolt, I purchased Burst sight-unseen, and I was not let down. While the first game drew more from Azure Striker Gunvolt, Inti Creates’ goal here was very clearly to make the game that Mighty No. 9 should have been. The intro and main stages are all based on the corresponding levels in MN9, and all the Mighty Numbers return as stage bosses. The “Wily Castle” (I don’t know a better umbrella term for these) stages are more original, but do bear a certain aesthetic resemblance to the final stage of MN9. 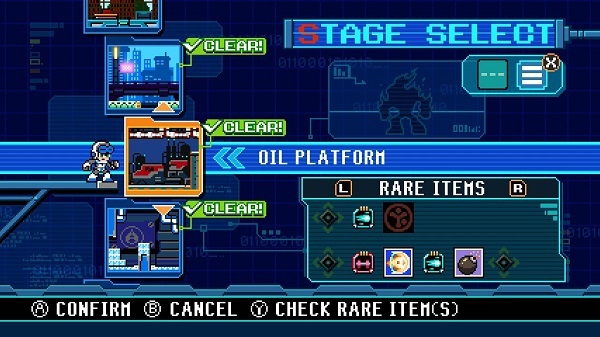 That isn’t to say that Mighty Gunvolt Burst is just Mighty No.9 rendered in pixels. Far from it. While the stage themes and boss characters are the same, stage layouts are completely new, with all new gimmicks and traps. Many of which, if I’m being honest, are much more interesting than those in MN9. It’s also very important to note that Burst does not fetishize instant-death traps the way MN9 does. Even while the Mighty Numbers do retain special half-health super moves, none of them are insta-kill attacks. This is very much appreciated, because MN9’s heavy focus on instant-death traps and attacks was one of the things I hated most about it. It’s also important to note that even though the Mighty Numbers have lost their insta-kill super moves, they are still absolutely fearsome foes. Their attacks hit hard, and they have maybe a little too much life. Like, roughly 2.5 times as much health as a standard Mega Man boss. This is mitigated nicely if you’re taking advantage of elemental weaknesses (like any sane person), but when you’re like me and dead-set on doing a default-gun-only run, it can get pretty rough. Aviator in particular was an incredibly frustrating fight. Brandish kinda sucked as well, if only because it is very difficult to dodge all three of the attacks in his super move. That said, it was really nice to see these characters in pixel-style (they way they ought to be) and the fights are well designed, it’s just that they’re just designed to be hard as balls, is all. One of the few things that Mighty No. 9 did exactly right was excising the traditional boss gauntlet that has plagued the Mega Man series forever. In a brilliant show of turning a trope on its head, MN9 actually has the Mighty Numbers aid you throughout the penultimate stage. It was a breath of fresh air, but it was not meant to last, as Mighty Gunvolt Burst goes right back to the old ways. And these are not bosses that you want to fight all in a row! They don’t even drop health after being defeated! I think I died at least 30 times on that godforsaken stage. At the very least, the final boss that follows is a very satisfying (and somewhat more forgiving) sequence of fights. On another somewhat tedious note is the fact that you must complete most levels at least three times if you want to collect everything. When you clear a stage, you’re given a choice of three collectibles to choose from, either a CP upgrade, a weapon part, or a sticker. And then you collect the other two from subsequent runs. Each stage is also littered with six or seven hidden collectibles, many of which are hidden in false walls, but can sometimes be out in the open or held by an enemy. And that brings us to what is far and away the most mind-blowing part of Mighty Gunvolt Burst: insane weapon customization mode. 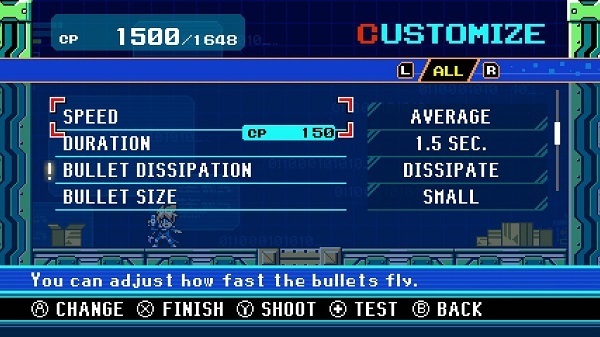 At first, you just get to choose what your bullets look like, which lets Beck choose from lemons, fireballs, drills, blades, so on and so forth (Gunvolt is stuck with the plain old “dart” style). There are a couple other options available from the start, like giving your shots an upward curve or reducing the distance that they travel. But as you progress and find more weapon parts, more and more customization options become available. An elemental power is always a stage clear prize from defeating one of the Mighty Numbers, but other wacky options can be found as in-stage collectibles. Some examples include: letting your shots bounce off or pass through walls, or making them move in a wave pattern, or giving you a spread shot, or having your shots detonate on contact. The really, really insane part is that you can tweak many of these options even further, like being able to change the degree of angled shots or the speed at which shots travel or how many fragments those detonated shots send out. So you can absolutely tailor your gun to however you darn well feel like playing, and you can save a total of 24 different customizations to swap between at any time. There are even options that allow you to make the game harder on yourself (like limiting how many shots can be on screen, or how long you have to wait between shots). There’s so much to play with here that you could have a great time just coming up with all sorts of different crazy combinations. One of the most elaborate customizations is the charge shot. You might expect the ability to change how long it takes to charge, and obviously you can choose whether to have it auto-charge or charge while you’re holding a button. What makes it wholly unique is that the charged blast is not simply a powered-up shot, but whichever one of your other saved customizations you want, effectively letting you equip two custom shots at once. The potential for game-breaking combos is endless! Of course, you can’t just toss in upgrades all willy-nilly. Each modification has a CP cost, and you’ll have to collect upgrades throughout the game if you’re intent on tricking out your weapon to its maximum potential. You start with a paltry 1000 CP, and the default gun setting eats up a whopping 950 of that, so there’s some work to be done before you can break the game in half with an overpowered configuration, but it won’t take long to earn more. By the end of my first run, without replaying any stages, I had somewhere in the range of 3800 CP. More than enough to make some cool customizations, but like I said before, I was very gung-ho about doing a buster-only run so I didn’t even use any of the extra space. But that’s exactly what New Game + is for. On top of all the weapon customizations, you also get a number of other equippable mods that can enhance or detract from your character’s abilities. The dowsing ability makes your joy-cons rumble when a secret is nearby, and you can stack on up to three air-dashes. There are also mods for your defences that can increase or decrease the amount of damage you take, and the amount of knockback that you suffer when hit. And of course, Beck and Gunvolt also get a few unique options each. Truly, this game lets you play in any which way you choose and gives you the freedom to make elaborate or miniscule tweaks at any time you like. Something even more exciting about this game is that like many of their recent titles, Inti Creates plans to continue to support it with DLC. I don’t think the exact details are out yet, but word on the street says that the third character from the original Mighty Gunvolt will be making a return, along with the possibility of new characters. Perhaps Ray, the vampiric anti-hero from MN9? Or even Jason and/or SOPHIA from Blaster Master Zero? Whatever it ends up being, I’m looking forward to more reasons to play this game over and over again! All of this said, the most important thing is that we finally have what you could call the legitimate successor to Mega Man. So many have tried, and up to this point, none had quite hit the mark. 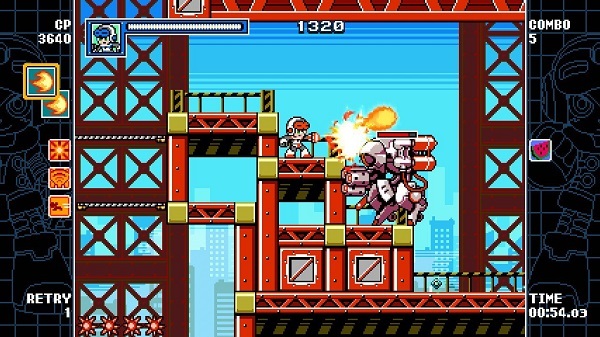 Mighty Gunvolt Burst absolutely feels like what a next-gen-but-still-retro Mega Man should be. Though it should come as no surprise that Inti Creates could pull off a superb Mega Man-alike, as they’ve been responsible for most of the actual Mega Man games since 2002, including the universally beloved Mega Man 9. Here’s hoping that it does well both critically and commercially, because it certainly deserves all the pent-up adoration and praise that Mega Man fans were expecting to shower on Mighty No.9.